The most traditional packet radio band, 2m still has quite a bit of packet activity. The Virginia Digital Emergency Network (VDEN) maintains some semblance of activity following the traditional packet radio methods including the use of nodes to pass messages along a chain of stations. Our goal is to not interfere with this network. We may well find it necessary to not deploy a port on this band to avoid interference. 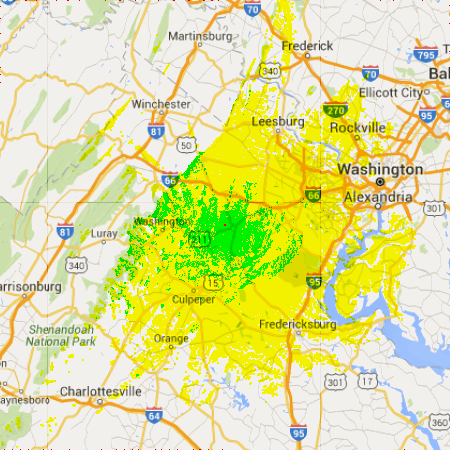 The coverage pattern from our primary mountain top site follows. The map is 124 x 124 miles. Comparing this with the 222 MHz plots shows little difference. The primary reason to provide a VHF 145 MHz port is to provide compatibility with the numerous equipment choices available today. KYPN notes, however, their 2m port is the least busy of their many frequencies. If the VHF port gets the nod, there will likely only be one.